The U.S. Navy plans to deploy a new submarine detection system, known as Low Frequency Active Sonar (LFA), throughout 80% of the world's oceans. LFA is based on the fact that very low frequency sound [100-1000 Hz] can travel great distances and detect quiet submarines. The LFA system uses intense sound, reportedly at levels in the range of 235 decibels or greater [the Navy has given a figure of 160 dB at about 2 km from the LFA] generated by massive sound transmitters towed behind TAGOS-class ships. Current passive SURTASS towed array sonars are limited in their capability to detect quiet submarines. Thus research has been going on for some time in the area of low frequency active (LFA) towed array sonar. LFA offers the potential for TAGOS ships to make longer range detections of quiet submarines. The shallow-water acoustics problem has risen in importance due to the increased salience of regional conflicts where the US Navy may to encounter slow, diesel submarines close to shore. The shallow-water, slow submarine is significantly more difficult to detect and classify acoustically than the cold war threat, due to the complex propagation, high clutter, and low target Doppler. Effective sonar performance requires new processing algorithms which cannot be implemented on current Naval platforms due the high processing requirements. A Hybrid Digital/Optical Processor (HyDOP) is to demonstrate the feasibility of using embedded scalable high performance digital and optical processing to solve this problem. This requires application of computationally intensive algorithms which cannot be implemented in real time using conventional processors. A high-speed optical correlator being developed by the Naval Research Laboratory (NRL) will act as a coprocessor to an Intel Paragon XP/S-25 computer. LFA has been under development for more than a decade, and has been tested perhaps 25 times in several oceans since 1988. The Navy has already tested LFA for over 7,500 hours. 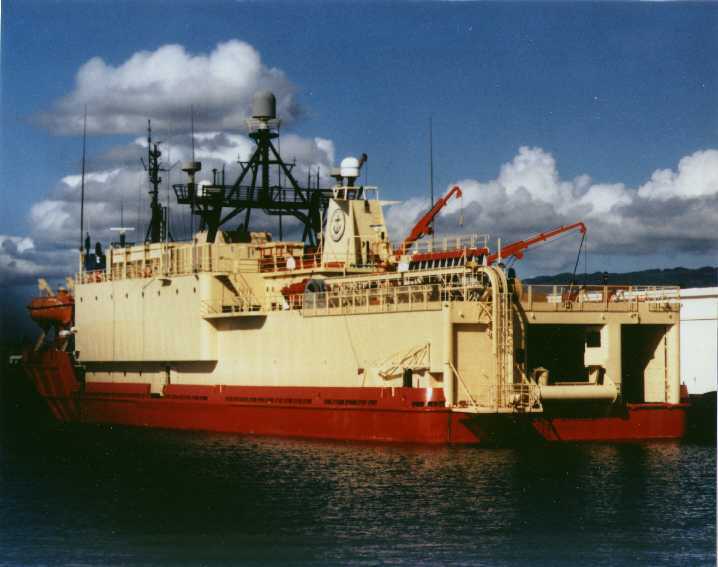 IOT&E of LFA was completed in October 1992, in the Gulf of Alaska, testing an engineering development model (EDM) of the LFA system installed in a converted, monohull research vessel. COMOPTEVFOR found the SURTASS LFA system potentially operationally effective and potentially operationally suitable. BBN has developed the ARTS array vehicle concept specifically to address the formidable problems of low-frequency active sonar sources. The array creates a dish shaped pattern of very loud, low frequency, variable broadband sound (235 dB re 1 �Pa @ 100-1000 Hz) that reaches out roughly 100 miles. 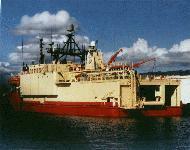 The towed array is deployed about 100 meters deep at three knots, pulsing on a 10% duty cycle. In recent experiments, Low-Frequency Active (LFA) system has detected submarines at long ranges. The first LFA ship, TAGOS 23, is under construction. Four dedicated vessels are planned, divided between the Atlantic and Pacific Fleets In the interim, a leased ship, Cory Chouest, is being used as a fleet asset to test and validate LFA technologies. In addition, compact acoustic source technologies are under development that will provide a 50% reduction in weight and power requirements. Successful maturing of these technologies will allow LFA-type arrays to be deployed from existing TAGOS 19-class vessels. Critics of LFA, such as the Natural Resources Defense Council [NRDC], charge that it will expose marine mammals to noise pollution at a level 200 billion times greater than that which is known to disturb them. Several years ago the $40 million acoustic thermometry of ocean climate (ATOC) program of the Scripps Institution of Oceanography in La Jolla, CA proposed to operate a low frequency underwater sound source in the heart of the Monterey Bay National Marine Sanctuary. Although ATOC proposed to generate noise at a level of only 195 decibels, NRDC successfully intervened to stop this research program pending further study of the effects of low-frequency sound on marine mammals. The Navy has agreed to NRDC's request that an EIS be prepared for the LFA program. The LFA Draft Environmental Impact Statement is due in August 1997, and is being written by the contractor for the system. The American Oceans Campaign has been working in coalition with a number of other environmental groups to keep tabs on government and industry underwater sound generation.